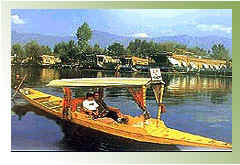 Srinagar, Srinagar Tours, Srinagar Travels, Srinagar Kashmir, Srinagar India Srinagar Houseboats, Houseboat in Srinagar ,Srinagar Tourism. Kalhana, the author of 'Rajtarangini�, states that Srinagri was founded by Emperor Ashoka (3rd Century BC). The presen t city of Srinagar was founded by Pravarasena-II, and Hiuen Tsang, who visited Kashmir in 631 AD, found it at the same site as it is today. Laltaditya Muktapida was the most illustrious ruler of Kashmir in the Hindu period, which ended in 1339 AD. King Zain-ul-Abidin (1420-70 AD), popularly known as �Budshah�, was a great patron of Sanskrit. Akbar captured Kashmir valley for the Mughals, who endowed Srinagar with beautiful mosques and gardens. The Sikhs overthrew the last Muslim ruler in the reign of Maharaja Ranjit Singh in 1819. In 1846 the Dogras secured the sovereignty of Kashmir from the British under the Treaty of Amrjtsar, and in 1947 the state of Jammu and Kashmir with Srinagar as its capital, became part of the Indian Union. The most confusing parts of Srinagar for it's not really one lake at all, but three. Further more much of it is hardly what one would expect a lake to be like - it's a maze of intricate waterways and channels, floating islands of vegetation, houseboats that look so firmly moored they could almost be islands and hotels on islands which look like they could simply float away. 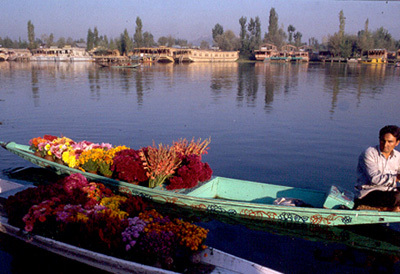 Dal Lake lies immediately to the east and north of Srinagar and stretches over 5-km. 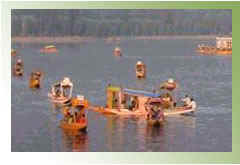 The lake is divided into Gagribal, Lokut Dal and Bod Dal by a series of causeways The main causeway across the lake carries the water pipeline for Srinagar's main water supply. Dal gate, at the city end of Dal Lake, controls the flow of the lake into the Jhelum river canal. It's the steady flow of water through the lake, combined with its relatively cold temperature, which keeps it so clear looking. 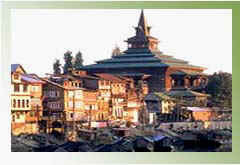 Nagin is generally held to be the most beautiful of the Dal lakes. Its name comes from the many trees, which encircle the small, deep blue lake. Nagin is only separated from the Larer Dal lakes by a narrow causeway and it also has a number of houseboats moored around its perimeter. Nagin Lake, which is usually thought of as a separate lake, is also divided from Dal Lake only by a causeway. The causeways are mostly suitable for walkers and bicycles only so they make a very pleasant way of seeing the lake without having to worry about traffic or Shikaras. If one wats to really get away from the chaotic city life all then Nagin is a good place to find a house boat and do it the surroundings are much more serene and isolated than on Dal Lake. One can rent rowboats from the camping site here - either to simply row around the lake or to look around for a houseboat. Kashmir was a favourite of the Mughal emperors who visited it as often as they could. Cool and refreshing after the plains of North India where the business of governance kept them, they planted gardens with stepped terraces and flowing watercourses. When they rested in their gardens, they dreamt they were in paradise. The next garden along the road that encircles the Dal is the Nishat, built by empress Nur Jahan's brother Asaf Khan. The largest of the gardens, Nishat has several terraces, a central watercourse and a majestic site between the Dal and the Zabarwan hills. 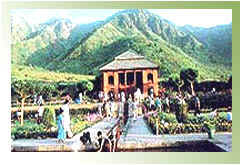 The third Mughal garden - the Shalimar - was planted by Jehangir, the Mughal emperor, whose love for Kashmir was legendary. Shaded by magnificent Chinar trees, the Shalimar is a series of stone pavilions and flowing water with paint box bright flowerbeds. T he Shalimar were built by Emperor Jehangir for his wife Nur Jahan, 'light of the world' in 1616. Although it is known today as the 'garden of love' it was originally named the Farah Bakhsh or 'delightful garden'. The garden is built in four terraces with traditional water channel running down the middle. The gardens measure 540 by 183 metres. During the Mughal period the top terraces used be reserved for the emperor and the ladies of the court and was the most magnificent. It included a pavilion made of black stone in the middle of the tank. Black Marble fluted pillars supported the pavilion, which was used as a banquet hall. Shalimar Bagh has an air of seclusion and repose, and its rows of fountains and shaded trees seem to recede towards the snowcapped mountains. A Son Et Lumeiere or sound and light show is put on here every evening during the May to October tourist season. The Nishat Bagh is another lovely garden with its 12 terraces representing the 12 signs of the zodiac, which descend gradually and seem to almost merge into the lake. It is situated on the banks of world famous Dal Lake in the backdrop of Zabarwan hills. With its flowerbeds, trees, fountains, the Nishat presents a dramatic sight. The gardens were designed in 1633 by Asaf Khan, brother of Nur Jahan, and follow the same pattern as the Shalimar gardens with a polished stone channel running down the centre and a series of terraces. 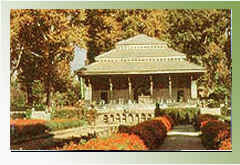 Cheshma Shahi is the first Mughal garden one will pass after Nehru Park. Built at a height above the city, its views are as stupendous as its layout. The smallest of Srinagar's Mughal gardens, Cheshma Shahi has only three terraces in addition to a natural spring of water enclosed in a stone pavilion.